An International Criminal Court exhibit. Presented by the Gallery Space at Wagner and the Center for Human Rights & Global Justice at NYU School of Law. Join us for the opening of Trauma, healing and hope, the Spring 2019 exhibition at the Gallery Space at Wagner. 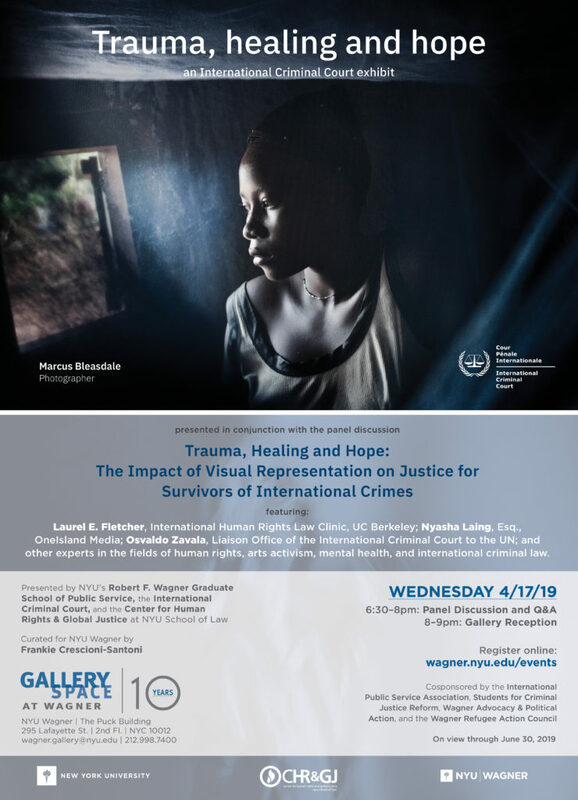 The exhibit features selected photographs from a photo-activism project sponsored by the International Criminal Court (ICC). It powerfully documents the stories of survivors of atrocity, following their paths through trauma, insecurity, loss, and the initial steps toward healing and hope. Award-winning photographer Marcus Bleasdale (National Geographic, Human Rights Watch) captured the images between 2003 and 2014 in conflict-affected regions of Africa and Eastern Europe, including the Central African Republic, Democratic Republic of the Congo, Georgia, and Uganda. Nyasha Laing, Esq., founder of OneIsland Media, moderates. The program will start with the panel discussion and Q&A from 6:30pm to 8:00pm. A reception will immediately follow from 8:00pm to 9:00pm. Trauma, healing and hope is curated for New York University by Frankie Crescioni-Santoni. The event is cosponsored by the International Public Service Association, Students for Criminal Justice Reform, Wagner Advocacy & Political Action, and the Wagner Refugee Action Council. For more information, please contact wagner.gallery@nyu.edu or call 212.998.7401.